The future of Justin Fields is unclear, even as the NCAA held its annual convention in Orlando over the weekend. Fields, a quarterback at OSU enrolled at the school this week after spending his first season playing college football at the University Georgia. He has asked the NCAA for immediate eligibility in hopes of playing this academic year. Typically, Fields would have to sit out a year after transferring, but his attorney, Thomas Mars, has said that a new NCAA transfer waiver guideline that was put in place last April should be utilized. Fields’ decision to transfer was heightened, in part, after he was the subject of racist comments. Fields’ request for the immediate transfer waiver has received public support from civil rights leader, the Rev. Al Sharpton, who said that the 19-year-old from Kennesaw, Georgia should be allowed to play football this year. 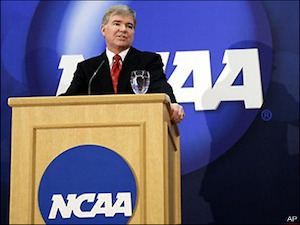 It is unclear when the NCAA will make a decision on the case. But the NCAA’s board of governors has given initial approval to a measure aimed at preventing non-traumatic deaths in offseason workouts. The decision comes in the wake of the death of Jordan McNair, the Maryland football player who died in June after a workout. The association also voted to allow leaders from outside higher education to join college and university presidents on the NCAA board for the first time. At the convention, the University of Wisconsin-River Falls athletics department received the 2019 Award for Diversity and Inclusion. Albert said that UW-Rivers Falls has implemented policies and programming that has made diversity and inclusion a top priority for the athletics department. Former UCLA star and Olympic champion Jackie Joyner-Kersee received the NCAA President’s Gerald R. Ford Award, which honors an individual who has provided significant leadership to college sports. In a conversation with NCAA President Mark Emmert, Joyner-Kersee said that she opened up a community center in her home town of East St. Louis, to give young people an opportunity to excel.